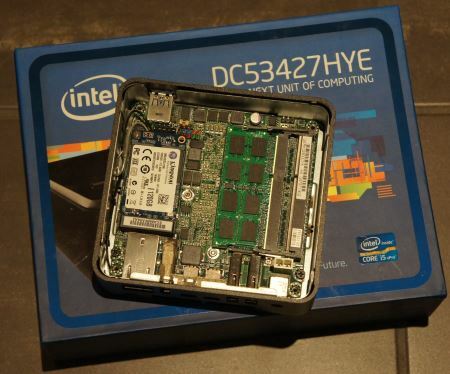 Intel is pushing a new form factor, the Next Unit of Computing (NUC), and it is looking good. I recently got two of these and have some pictures and experiences to share. The NUCs have some exciting properties and a couple of gotchas, read on and avoid my mistakes. First of all the box itself has a small surprise. When it opens it plays the Intel jingle from some embedded electronics with a light-sensor and a speaker. Oh, the humanity. Inside the box is the power supply, the surprisingly small unit itself and a solid metal bracket (and six screws for this). 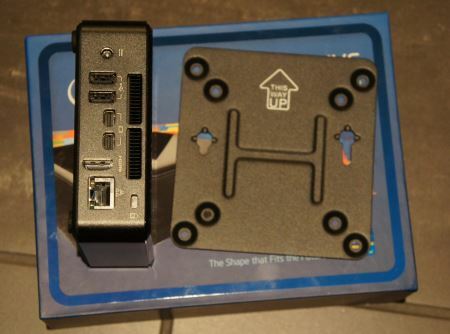 The bracket is a VESA mount used for hanging the NUC on the back of a monitor. This is a very clever way to get the unit out of the way and put all those monitor VESA mounts to good use. 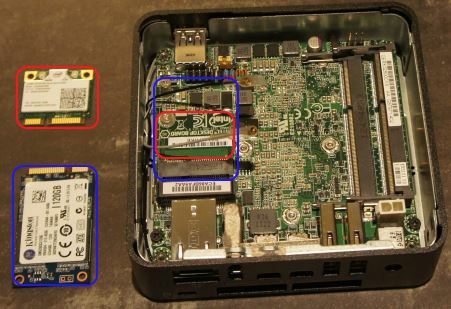 Also, while having two WLAN antennas inside, the unit does not contain a motherboard with onboard WLAN. WLAN and mSATA are mounted above each other. Note that due to the crammed space inside, the parts are as small as possible. If you want to get a suitable WLAN adapter, make sure to get a PCI Express half mini adapter such as the Intel Centrino Advanced-N 6205 (top left). And most importantly, the disk is an mSATA (lower left), an until-now quite unusual form factor and currently only available as SSD. My usual webshop does not yet even have a category for mSATAs, they are hidden amongst ordinary SSD SATA drives, which caused me to actually order the wrong drive the first time around. The brick-and-mortar stores in my city does not yet stock mSATAs at all. WLAN, mSATA and RAM mounted. 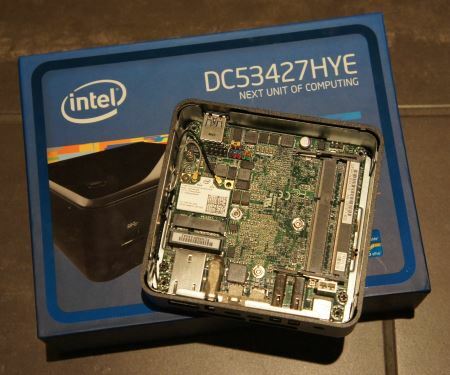 This particular NUC boasts an impressive amount of display IO for the small size. Two mini display ports in addition to HDMI is not commonplace. Apart from this there is ethernet and three USBs (two shown here and one available on the other side). All NUCs restrain themselvs to Intel onboard graphics. While models with HD5000 are on their way this month, only models with HD4000 are actually in stock right now. I really like the monitor mount. 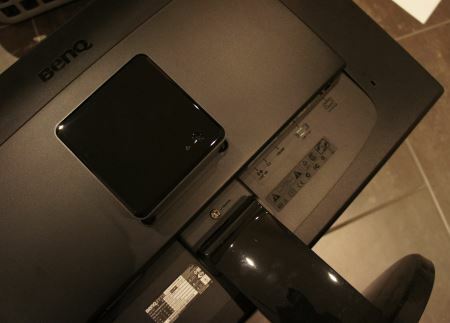 The NUC is not screwed in place, merely hinged on to the metal bracket, but fits snugly. The end result is a stationary computer without the usual space-consuming tower to hide.